When I was a young pastor, I was eager to find and replicate worthy ministry models. I was attracted to the church growth movement. I admired the soul-winning zeal of practioners who counseled young pastors like me to fashion their Sunday services so the “seeker” wouldn’t trip over man-made obstacles on his way to finding Jesus. 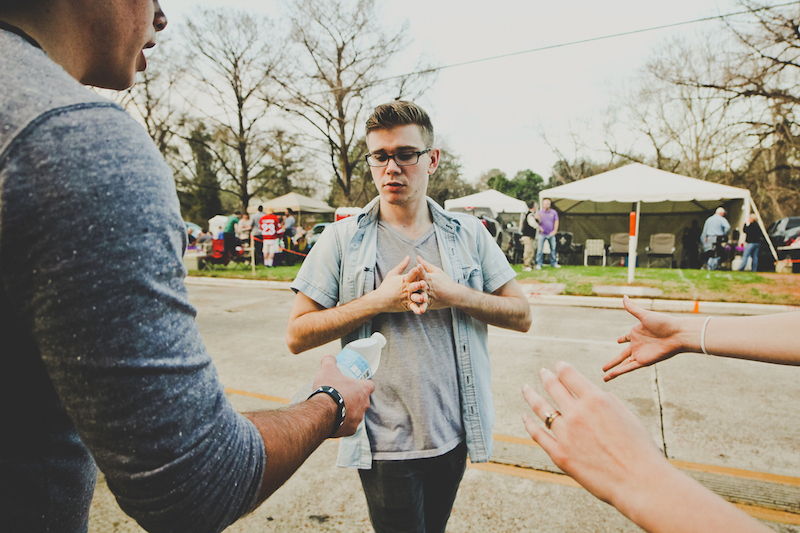 While I absorbed many of its lessons—clear communication, ministry excellence, community outreach—I began to have some questions about an approach that shapes the Sunday gathering exclusively around the unbeliever. I say “exclusively” because every pastor should have, in his mind, the image of a lost soul when he steps up to the pulpit to preach. He shouldn’t assume his audience is entirely made up of believers, and his preaching should be clear enough so the lost know how to repent and believe. Paul counseled Timothy to “do the work of an evangelist,” after all (2 Tim. 2:5). There are, however, three vital questions to ask ourselves about our worship services. 1. What’s happening on Sunday mornings? According to standard church growth philosophy, the Sunday gathering is the prime opportunity to invite unbelieving friends and neighbors to hear a gospel presentation. To make worship attractive, churches are encouraged to remove barriers that might offend those not fluent in Christian vocabulary. This isn’t an entirely bad discipline. After all, our churches shouldn’t be contextualized to the 1950s if we’re living in 2016. We should hold preferences loosely in order to reach our communities for Christ (1 Cor. 9:19), and we should dream, plan, craft strategies, and spend resources for reaching the lost. But should attractiveness to the lost be our primary guiding principle on Sunday mornings? If so, do we lose the distinct purpose for gathering with the saints? Do we forget that no amount of contextualization will make the gospel inoffensive? In his Upper Room discourse, Jesus warned his disciples of the countercultural nature of his message. And Paul knew, even after making himself “all things to all people,” that the gospel he preached would be a stumbling block, ultimately landing him in jail and leading to death. What’s more, in our increasingly pluralistic society, I wonder if these church growth methodologies will become less effective. Studies indicate Americans are less inclined to attend worship services than they were in previous generations. We should ask ourselves: How do we see the Sunday gathering? Do we see it as an inspirational TED Talk with good music? Or do we see it the way the New Testament does, as God’s called-out people assembling for worship and mobilizing for mission? Music styles and preaching patterns will vary, but some elements should remain fixed. Paul instructed Timothy, as the pastor of the church at Ephesus, to “devote himself to the public reading of Scripture, to exhortation and teaching” (1 Tim. 4:13). He also instructed the same church to sing “psalms and hymns and spiritual songs” (Eph. 5:19). And our Lord Jesus entrusted to local churches the sacraments of baptism and the Lord’s Supper. We should not be embarrassed by the Christian language and rhythms of the Sunday gathering. We should gather with the expressed goal to declare to the world, to ourselves, and to the cosmic powers our worship of Christ as King. 2. Who’s writing the liturgy? For some evangelicals, the word “liturgy” conjures up stuffy traditionalism at odds with genuine faith in Christ. But every church has a liturgy, a way of ordering their worship service. And every church’s liturgy communicates much about what it values. This is another reason to be concerned about an approach that prioritizes the Sunday gathering for the unsaved person. In essence, this makes the unregenerate seeker the worship leader, tasked with writing the liturgy. Someone who hasn’t been redeemed by the Spirit of God is determining what practices and spiritual rhythms the body of Christ will embrace when they gather to worship. Last year I attended a college football game in Nashville with some friends. I was invited by a colleague who is a school alum and unapologetic fan. It struck me, as I sat in his team’s section, that they didn’t really care how their particular rituals affected me, an outsider. They were simply proud of their team and wanted everyone, including me, to know it. This wasn’t offensive; it was attractive. What was it about their university that so motivated them to lose themselves in celebration at a football game? The loyal fan base embraced me, but they didn’t allow me to determine their game-day liturgy. The band didn’t play music more amenable to my preferences. The cheeerleaders didn’t craft a generic routine I might understand. The fans didn’t wear generic clothing so I’d fit in. The experience made me wonder: Why should our church services be any different? The seeker who enters the doors of our church should be welcomed, loved, and served. We should labor to declare the gospel to him in language he understands. But sidelining the rhythms of Christian worship communicates embarrassment about what we claim matters most. 3. What’s the shepherd’s task? We should also ask: what’s the pastor’s role? Peter seems to define it pretty specifically when he exhorts pastors to “shepherd the flock of God that is among you.” This has two important implications. First, the pastor’s primary role is to exposit God’s Word and feed God’s people. Can we accomplish this weighty task if our messages are inspirational chats with little scriptural content? Will people grow toward Christlikeness if the seeker is writing our sermons? Second, Peter assumes the preacher’s primary audience will be Christians. Shepherd and feed the flock of God that is among you. We should always provide opportunities for the seeker to repent and believe, but our first job is to “preach the Word” (2 Tim. 4:2) to the people he has sovereignly placed under our care, those for whom we will give an account (Heb. 13:17). This tells us about how the Great Commission is primarily accomplished: through the discipling of God’s people and mobilizing them for evangelistic mission in their communities. This isn’t to say churches shouldn’t host special, seeker-friendly events. But this shouldn’t be the primary purpose of our Sunday gathering. Otherwise, we’ll have churches full of people feeding on milk instead of meat, poorly equipped to evangelize, and unable to apply the gospel amid shifting cultural currents. Editors’ note: The Gospel Coalition’s Theological Vision for Ministry states: “Because of the attractiveness of its community and the humility of its people, a gospel-centered church should find people in its midst who are exploring and trying to understand Christianity. It must welcome them in hundreds of ways. It will do little to make them ‘comfortable’ but will do much to make its message understandable.